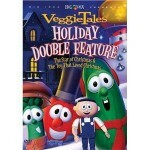 This special VeggieTales Holiday collection contains the two big Christmas specials from VeggieTales. In the first one, “The Toy That Saved Christmas,” Mr. Nezzer has convinced everyone that they need to spend lots of money and buy lots of toys in order to have a great Christmas. However, that’s not what Christmas is all about! In the second one, “The Star of Christmas,” everyone ends up in Victorian England planning a spectacular Christmas event. However, the church is also doing a Christmas pageant. The two events collide, and make Christmas a bit more complicated!